Wallace, David Rains. (1985). The Turquoise Dragon. The Yolla Bolly Press; California. I picked up this book at the library and signed it out primarily because the synopsis began as follows: “…George Kilgore, a forester living quietly in the foothills of California’s rugged Klamath Mountains, stumbles into a deadly web of intrigue when he discovers the body of a murdered biologist friend” (Wallace, 1985). Darn! That’s the kind of tale for me. Photo credit to Sandra Dean, 1985. And, true to form, I enjoyed this book as much as I hoped and expected. 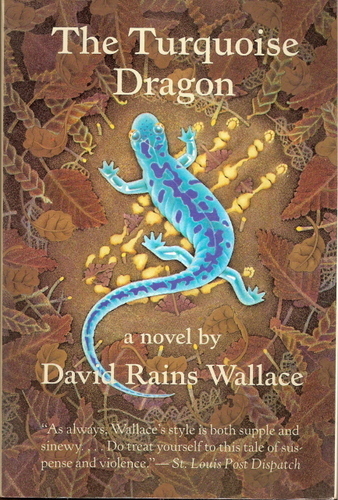 David Rains Wallace is an author of more than sixteen books on conservation and natural history, and has written multiple articles for The Nature Conservancy and the Sierra Club; consequently, this particular novel is part of the Sierra Club Books series (Wikipedia article). The story deals with the intrigue generated by an eccentric collector of rare species, the threat of a hydroelectric damming project, a protagonist with a past in illicit drug activities, and a “salamander of spectacular beauty” (Wallace, 1985). Although nowhere near as subversive and counter-culture as The Monkey Wrench Gang, this was a thought-provoking read with a few unexpected plot twists. David clearly has a sense of humour, too, as I often found myself bursting into laughter due to his wry wit and cavalier tone of voice. I would caution people anyone against expecting a complete denouement, however; there is no sense of retribution for wrongdoers by the end of the novel.